Favorite foods are difficult to choose. After thirty years of life I think I can safely say that a toasted bagel with a generous layer of whipped cream cheese is at the top of my list. Perfection. Unfortunately there are a lot of bad bagels out there in the world, which is why making good ones at home is totally worth the time. Make the dough and form them on day one, then boil and bake them on day two. It's a perfect weekend project and they freeze well, so you can be in happy bagel land all week. Doesn't that sound like a nice place to be? Take your starter out of the fridge and feed it the day before you plan to make the bagels. I used an electric mixer but you could also make the dough by hand or in a food processor. The technique for forming the bagels comes from Cook's Illustrated, but the recipe is my own. Add the starter, flour, water, molasses, yeast and salt to the bowl of an electric mixer. With the paddle attachment, mix the ingredients on low speed until all of the flour is incorporated, about 1 minute. Allow the dough to rest for 10 minutes. Switch to the dough hook and knead for 1-2 minutes until the dough is smooth and elastic. Turn the dough out onto a clean, unfloured counter. Use a pastry cutter to divide the dough into 12 pieces. Gently roll each piece in your hand to form a small round. Cover in plastic wrap and let rest for 15 minutes. Cover two baking sheets with a single layer of plastic wrap. When 15 minutes has passed, begin working with one ball of dough at a time. Lightly coat the ball of dough with a sprinkling of flour, then use a rolling pin to roll the dough out into a 5-6 inch round. Beginning at the end farthest away from you, roll the dough toward you, forming a tight roll. Use both hands, held flat, to gently roll the dough into a rope about 10 inches long. Do not taper the ends. 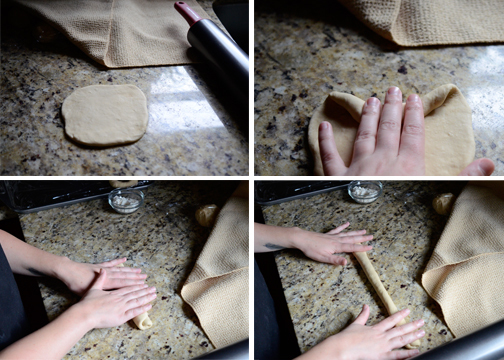 Twist the rope of dough by holding your hands on the ends and rolling in opposite directions. 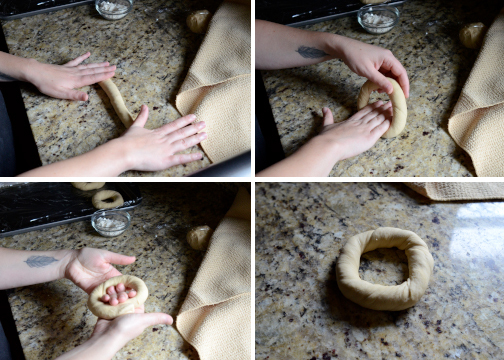 Hold one end of the twisted dough in your hand and pull the other around to join the ends and form a ring. 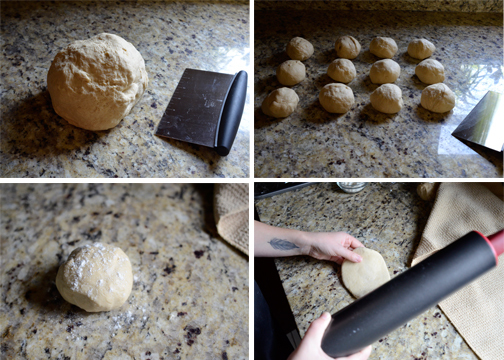 Press the two ends of dough together on the counter and gently roll with your hand. Place the dough ring on the plastic-covered baking sheet. Repeat with remaining balls of dough, leaving an inch between each ring on the baking sheets. Cover both baking sheets loosely with a sheet of plastic wrap. Allow them to rest at room temperature for 1 hour. Then, tightly cover each sheet with plastic wrap and place them in the fridge for 16-24 hours. One hour before baking, place a baking stone on the middle shelf of the oven and preheat to 450 degrees. Bring the water, sugar, and baking soda to a boil in a dutch oven. Remove the bagels from the fridge and gently slide them off of the baking sheets, including the top and bottom layers of plastic wrap. Using a pair of scissors, cut through the plastic wrap to separate each bagel (this makes it easier to move the individual bagels and remove the layers).Place a rack into each of the baking sheets and top each with a piece of parchment paper. Gently remove the plastic wrap from one of the bagels and transfer to the boiling water. Boil for 20 seconds, flip over, and boil for an additional 20 seconds. Gently remove the bagel from the boiling water and place it upside-down on the parchment-lined racks. Repeat this process until all of the bagels have been boiled. Pour 1/2 cup of boiling water into the rimmed baking sheet and place it in the oven. Bake for 10-12 minutes. Removed the bagels from the oven and carefully flip them, removing the parchment paper as you do. Return to the oven and bake for 10-12 minutes more. When the bagels have browned to your liking, take them out of the oven and allow them to dry on racks until cool. These are best eaten the day they are made but hold up well in the freezer.